Dr. David Leffler, a United States Air Force veteran, is the Executive Director of the Center for Advanced Military Science (CAMS). David served as an Associate of the Proteus Management Group at the Center for Strategic Leadership, US Army War College and is a member of the U.S. Naval Institute. 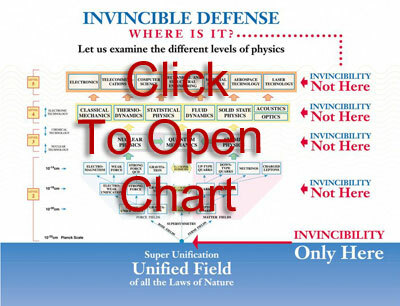 Dr. Leffler teaches Invincible Defense Technology and is available at: http://www.StrongMilitary.org. A Valuable Tool For Ending Middle East Violence Violence, war and terrorism are intractable problems worldwide. Current events have shown without a doubt that new responses are needed now. This article has been published at the following locations: ISRAEL: Israel Faxx, MEPeace, [Middle East Peace] MIDDLE EAST: Change Now! The Arab Network for the Study of Democracy, and GREECE: CBRNE Diary (CBRNE stands for "Chemical, Biological, Radiological, Nuclear, and Explosive). Attn: President Putin - No Enemies = No Nuclear War President Vladimir Putin asserts Russian scientists have developed an "invincible" cruise missile. While scientists have sought invincibility by applying ever-advancing technologies, history has shown us this approach does not work. Adversaries inevitably devise ways to counter any system of offense or defense. However, there is a scientifically-validated way of achieving unquestioned invincibility for any leader who seeks it. Thirty Years From Now ... What will war and terrorism look like in 30 years? 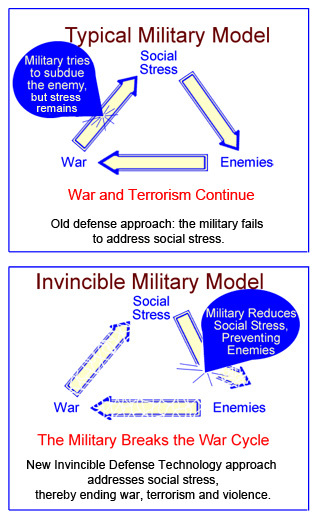 Perhaps if we wake up to the Power of the Mind, via TM and Invincible Defense Technology (IDT), war and terrorism could become obsolete due to the absence of enemies. An excellent piece of speculative fiction (and a fun read), written and meticulously researched by Dr. David Leffler, Exec. Director of CAMS, an organization dedicated to implementing IDT in militaries worldwide. Peace Through Meditation? An Unconventional Solution for the South Sudan Mess "War is an instrument entirely inefficient toward redressing wrong; and multiplies, instead of indemnifying losses." Thomas Jefferson. South Sudan is turmoil. UN peacekeeping soldiers want to help but the nation doesn't want to be "taken over." 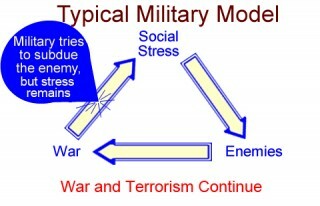 The anger of PTSD triggers violence. A non-threatening, cost-effective, evidence-based PTSD-reduction approach is needed. 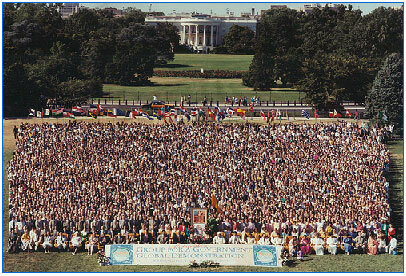 Find out about a new next-generation peace-creating strategy. Preventing Future Boko Haram Attacks Violence & conflict plagued mankind throughout history. Boko Haram's attacks are a current manifestation. How can Nigeria protect itself from future attacks? The best way to guard against terrorist threats is to have no enemies. No enemies = no terrorism! An effective approach called Invincible Defence Technology could help Nigeria's military create lasting peace by preventing enemies from arising. A New Proven Way to Create Peace in Ukraine Tensions rise as Russia intervenes in Crimea. World leaders search for ways to prevent tensions from further escalating. What can be done to find a peaceful solution to this serious crisis? Countries around the world have shown growing interest in a novel, but scientifically verified, militarily field-tested approach to reducing turmoil. 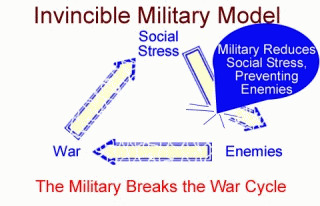 Among military circles worldwide this approach is known as Invincible Defense Technology. Reducing Tension in the Middle East History shows that political resolutions cannot be achieved while tensions remain high. Deep-rooted ethnic and national stresses embedded in the collective consciousness are at the basis of the Israel and Hamas conflict, as in all other conflicts worldwide. Unless these stresses are rooted out, destruction and killing will continue, as they have for millennia. Now there is hope because a proven peace technology is available. Combating Stress in Police Work and Preventing Crime, Terrorism, and War ""in a very dangerous part of New York City. While walking in an alley, they were ambushed. A shot rang out, and his partner fell wounded to the ground. This officer drew his revolver and quickly shot five assassins, killing four and disabling the fifth"if it were not for his regular TM practice, he would have been killed. Despite the overwhelming odds"the policeman said he was able to maintain his composure under fire..."
Combating PTSD This article offers a scientifically verified time-tested solution to help our military personnel, veterans and their families. In a new pilot study (under review), Iraq and Afghanistan veterans experienced a 50% drop in PTSD symptoms by the fourth week of TM practice, and greater improvements by two months and three months. This study is summarized in the new book The Resilient Warrior: Healing the Hidden Wounds of War. Military Application of Transcendental Meditation Gaining Acceptance A leading scientific journal in Pakistan, The Journal of Management & Social Science, recently published a paper titled "A New Role for the Military: Preventing Enemies from Arising-Reviving an Ancient Approach to Peace," indicating that the military application of the Transcendental Meditation (TM) technique has merit. It discusses how militaries worldwide could use TM and its advanced practices to prevent war and terrorism. 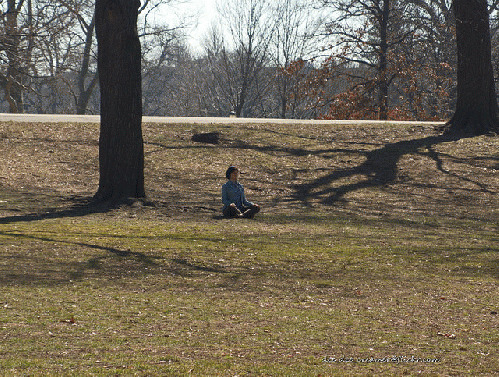 Transcendental Meditation Could Help Veterans Administration The US military and Veterans Administration could greatly reduce our returning warriors' stress-related problems including Post-Traumatic Stress Disorder (PTSD) - and save money - by prescribing the scientifically-validated Transcendental Meditation (TM) program. Peace for Uganda? Yes, Says Science on the Maharishi Effect For over 20 years, President Yoweri Kaguta Museveni and his military have tried and failed to eliminate violent extremism. Conventional approaches to national defense can no longer guarantee peace and security, and a new approach is crucial. A proven new defense technology called Invincible Defense Technology (IDT), could be easily applied, is cost-effective, and prevents disruption and attack from within or outside a country.